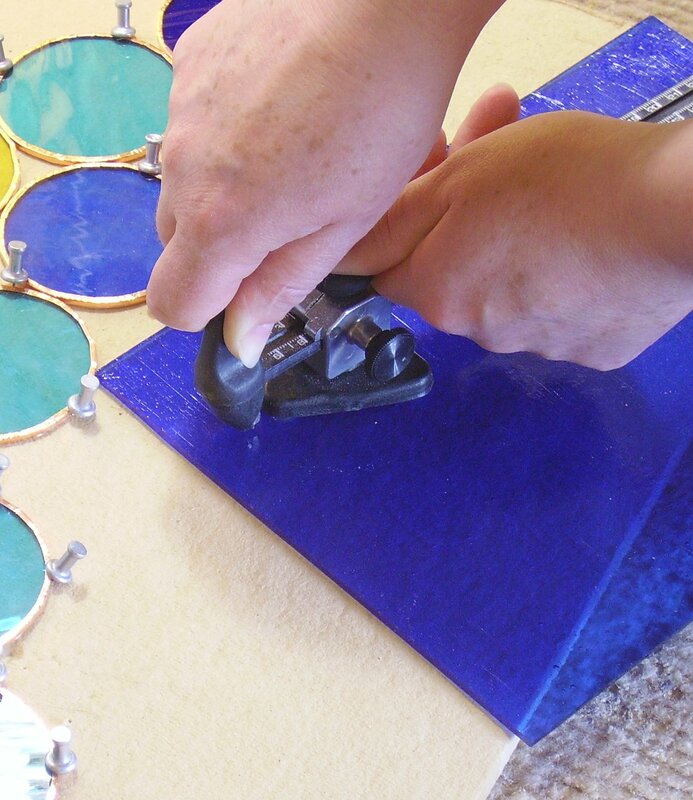 Designing it and making it – commission a piece of stained glass and do all the hard work too! 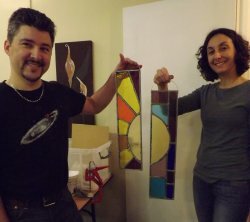 What could be better than commissioning a piece of stained glass? Designing it and making it – of course! Have you noticed that the ‘don’t buy it, make it’ movement is really gathering momentum? This is something Jenny and I (Vitreus Art) are being asked for more often than ever. Although it’s a little counter-intuitive to be agreeing to help potential customers make their own commissions, we reason that the pleasure of owning art is enhanced by having had some involvement is creating it. We always go to considerable lengths when discussing commissions with clients to uncover their tastes, incorporate their ideas, and to give them the opportunity and means to decide on colours and textures. Agreeing to teach the client and help them make their own piece is taking this to a logical further step – if they want. 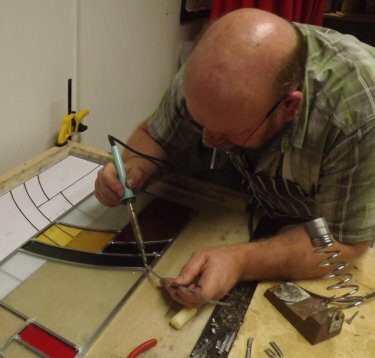 Of course we still welcome commissions in the conventional sense, but just as we’ve seen our teaching practice expand along with the growing interest in craft courses and artisan-made work, so has interest in designing one’s own stained glass. 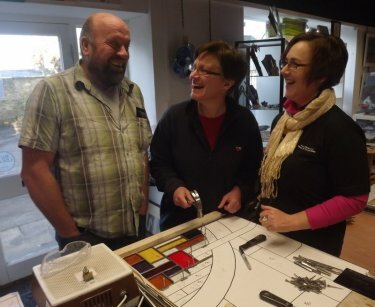 A few weekends ago we began teaching Deb and Mick to make stained glass in the traditional leading method – as part of their project to make 4 stained glass panels for a new door and surround they’d had made. The project began some months before, however – when the couple visited us at an Open Studios event at our Adstock studio. 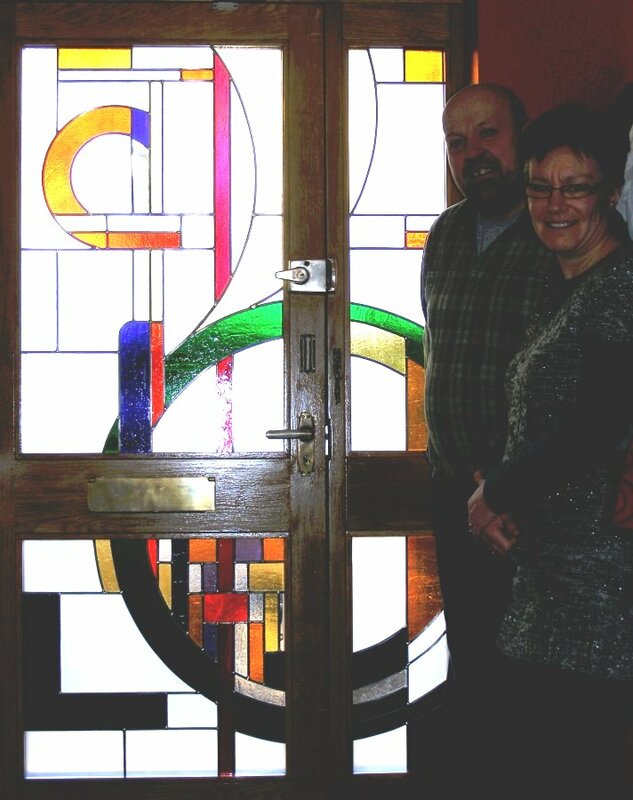 Deb says: “We knew we needed a front door and thought it might be nice to have some stained glass in it but we wanted to have a hand in the design rather than have something traditional. The couple designed their own suite of 4 inter-connected windows, having discussed their design ideas with us at the ‘pencil and paper’ stage. We shared the basic design rules and offered feedback. Later on, when the door woodwork was ready, Jenny and I visited to help refine the design and agree a final colour selection. Mick takes up the story: “Jenny and Mike helped us to understand what was possible in terms of the design but have always taken the trouble to listen to our ideas and understand what we liked and wanted to achieve so that the finished work really does reflect our vision. Mick, Deb and Jenny – what is it about Deb and a hammer that’s making them laugh? We set aside a weekend and sourced the glass and lead cames needed – allowing for some wastage and ‘accidents’. 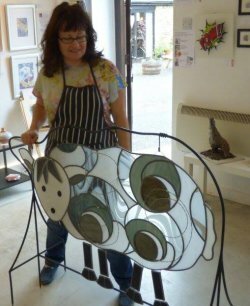 Sally Eaton of Rowans Gallery kindly allowed us to use her workshop, affording us more space than our own studios provide so that we could work in pairs on two windows at a time. 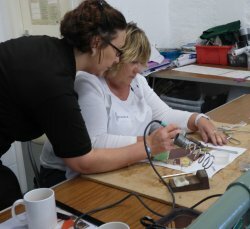 Deb comments: “When we met to make the panels they proved to be skilled teachers, helping us to quickly acquire the techniques we needed to start work. Some further time was required to finish the fourth, largest panel – proving that projects always take longer than one’s best estimates and highlighting that a bit of leeway to spend some extra time is advisable if planning a project of your own. Mick then began the work of installing the windows – not a task to be trivialised! The door and adjoining windows dimensions were sized to allow for a current-regs compliant sealed unit with the stained glass panels behind, all held in with a combination of mastic and matching wood beading for finish off. The result looks very similar to a traditional stained glass installation, with the benefit of additional security, thermal and noise proofing thanks to the sealed units. Deb and Mick sum up their experiences: “There is great pleasure in either designing or making but to do both is truly satisfying and with the help of this great team is not as daunting as you might think. We would like to thank Mike and Jenny for helping us achieve our vision. Well Deb and Mick – we really enjoyed working with you – you were great students and the results are a credit to both of you! We’ve estimated that the cost to the clients is probably similar to what it would have been if we’d made the panels ourselves. Even stevens – and two lovely people have had the pleasure of making something really significant for their home – and have an interesting story to tell their visitors! Having completed several of these projects now, and with a fair weight of experience accumulated along the way, we’re going to be offering this kind of ‘self-made commission’ project as one of our services. If you’ve made something in stained glass you’re proud of, head over to our Facebook page and post a photo or two – share what you’ve done! If you’d like to see some of the photos we took while working with Deb and Mick, you can see them here. 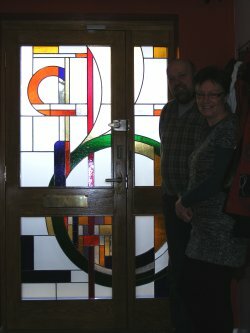 Or if you’d like to commission a piece of stained glass and would like to be involved in making it, get in touch! Happy holidays and here’s to a creative 2013! What got you started in art? 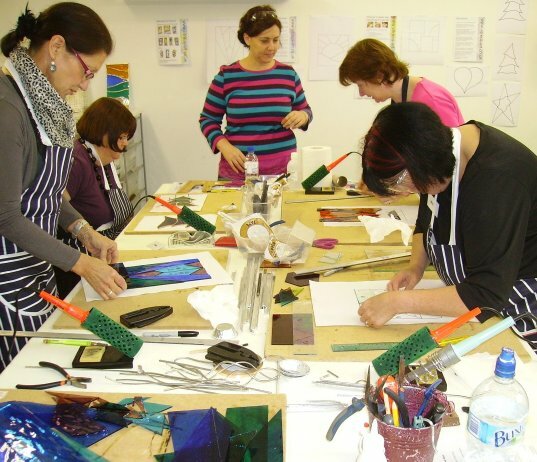 When we’re out and about, teaching, demonstrating, doing Open Studios or selling at craft markets, we’re often asked – what got you started in stained glass? Well, for Jenny, my partner in crime over at Vitreus Art, she found an artistic interest while watching her Grandfather painting with oils and making detailed models from scratch. She subsequently attended St Albans art college; becoming a mum sadly put such frivolities on hold for some years. Although Jenny sketched from time to time, being a busy mum and PR professional didn’t afford time to find a real niche and pursue it. Then, while on holiday in Porthleven in Cornwall we happened across the work of a stained glass artist who sadly has moved from the area. But we both loved the colours, the simple sea themes and the light effects the pieces created in the gallery. 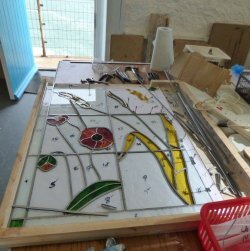 Returning home, we booked ourselves on to a one-day stained glass workshop to find out how hard it would be to create our own pieces. 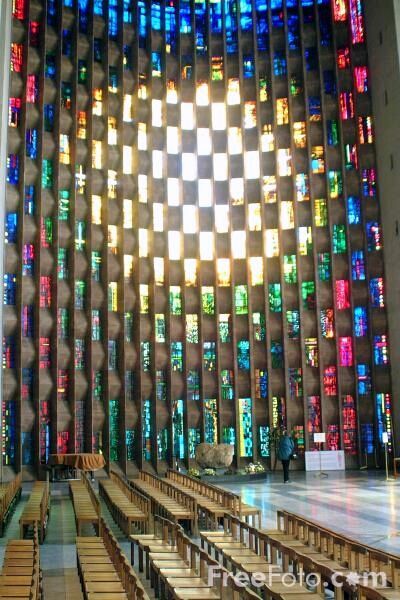 the beautiful abstract glass for the lantern at the Liverpool Metropolitan Cathedral and the 76ft-high Baptistry Window at Coventry Cathedral. You can see examples of the glass at both of these fabulous 20th century architectural marvels at John Piper’s website. I worked in theatre lighting on leaving college, and I’ve always been fascinated with creating coloured and textured light effects. As a comparative youngster, I never got the chance to really test out my imagination, but the passion persisted! 6 years later, we’re now teaching, helping prospective glass artists get started, and we’ve just finalised the plans for our own 5-day workshop in Porthleven, where our passion started! Do leave a comment and tell us how you got started in art, or what inspires you – share the passion!